The warm fall day starts like any other at the Center—a women’s reproductive health services clinic—its staff offering care to anyone who passes through its doors. Then, in late morning, a desperate and distraught gunman bursts in and opens fire, taking all inside hostage.But Wren is not alone. She will share the next and tensest few hours of her young life with a cast of unforgettable characters: A nurse who calms her own panic in order save the life of a wounded woman. A doctor who does his work not in spite of his faith but because of it, and who will find that faith tested as never before. A pro-life protester disguised as a patient, who now stands in the cross hairs of the same rage she herself has felt. A young woman who has come to terminate her pregnancy. And the disturbed individual himself, vowing to be heard. Told in a daring and enthralling narrative structure that counts backward through the hours of the standoff, this is a story that traces its way back to what brought each of these very different individuals to the same place on this fateful day. After rushing to the scene, Hugh McElroy, a police hostage negotiator, sets up a perimeter and begins making a plan to communicate with the gunman. As his phone vibrates with incoming text messages he glances at it and, to his horror, finds out that his fifteen-year-old daughter, Wren, is inside the clinic. It's rare that I am at a loss of words. Seriously, just ask my fiance, family, and friends. I usually have no problem gabbing about the book I just read. However, I am really struggling with this one. Not because I disliked it, the complete opposite in fact. A Spark of Light left me speechless. I am left struggling to find the words to explain to you how spectacular this book was. 3 words come to mind when thinking about this book: Breathtaking. Spectacular. Heart-stopping. I wish I could just end the review here. Really, that's all you need! However, I'll try to explain why you should read this book immediately. It's no secret that I am a big Jodi Picoult fan. She is one of my auto-buy authors; I'll buy whatever she writes without caring what it's about. 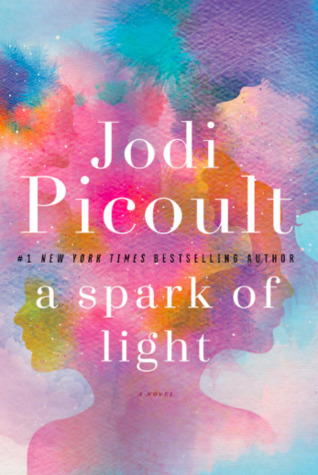 A Spark of Light just may be my favourite book of hers yet, and that is saying A LOT! A Spark of Light brings us a dynamic character cast and a very compelling storyline. The characters and their stories will have a very powerful effect on you. This novel tackles Abortion. Another amazing Picoult quality is how timely she is with her books. Abortion has always been a debate. However, it is even more important today, and this book is very relevant. Whether you agree, disagree or are indifferent, you will be left considering all the perspectives in this book; and will be left pondering long after you've put it down. I also loved the unique delivery. A Spark of Light is told in reverse. It really gives you a better glimpse at the characters, and how they all ended up at the center on that day. Impeccable writing, unforgettable characters, and very relevant subject matter, A Spark of Light will definitely spark something deep within you. Emotions will stir and questions will be raised. It is an intense story that will stay with you long after you've turned the last page.